Hey Kids — How to Give Dad the Same Tie you Gave him Last Year! I’ll never forget the Father’s Day when everyone gave Granddad a tie. We should have coordinated our gifts a little better but I guess no one in my family was using their imagination that year. Box after box, the disappointment grew on my grandfather’s face (even Dad got a can of English toffee). Finally, I handed Granddad my package. My careful attention to wrapping it with perfectly coordinated paper and ribbon could not disguise the tell tale long, flat box. He joked: “If I get one more tie, I’m going to have to hang someone with it!” Of course, Granddad wasn’t trying to be ungrateful but the message was received loud and clear. Around our house, ties became a taboo gift for Father’s Day. Whether or not the men in your family have the same attitude about receiving neckties, you probably have a surplus from years past. 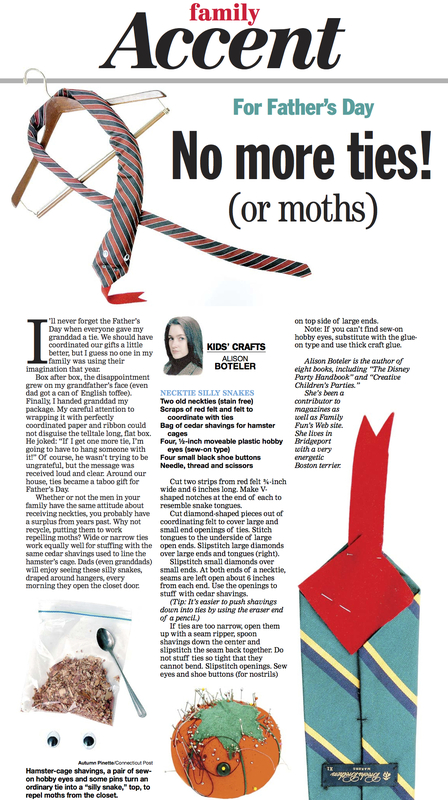 Why not recycle, putting them to work repelling moths? Wide or narrow ties work equally well for stuffing with the same cedar shavings used to line the hamster’s cage. Dads (even granddads) will enjoy seeing these silly snakes, draped around hangers, every morning they open the closet door. Cut two strips from red felt 3/4” wide and 6” long. Make “V” shaped notches at the end of each to resemble snake tongues. Cut diamond shaped pieces out of coordinating felt to cover large and small end openings of ties. Stitch tongues to the underside of large open ends. Slipstitch large diamonds over large ends and tongues. Slipstitch small diamonds over small ends. At both ends of a necktie, seams are left open about 6 “ from each end. Use the openings to stuff with cedar shavings. (Tip: It’s easier to push shavings down into ties by using the eraser end of a pencil. If ties are too narrow, open them up with a seam ripper, spoon shavings down the center and slipstich the seam back together.) Do not stuff ties so tight that they cannot bend. Slipstitch openings. Sew eyes and shoe buttons (for nostrils) on top side of large ends. *Note: If you can’t find sew on hobby eyes, substitute with the glue-on type and use thick craft glue. 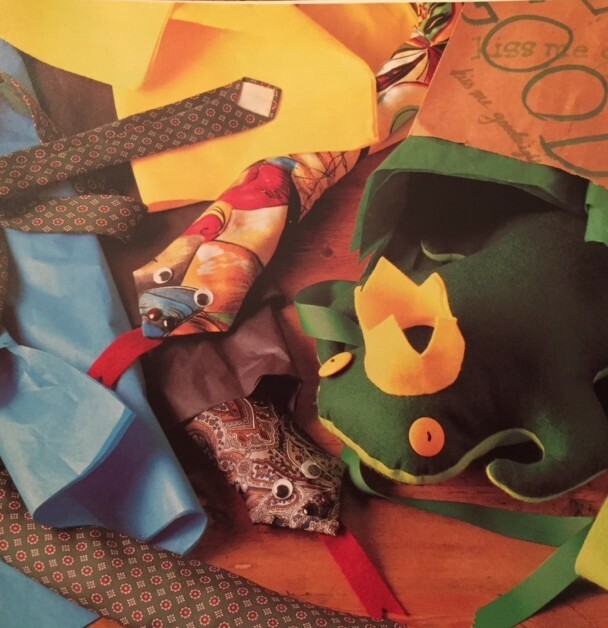 Here you can see some neck tie snakes straight out of my second book : What Should I Bring? Great Gifts for Every Occaision. In this photo, they’ve been paired with a frog prince pillow. I’m not sure I’d suggest kids make one of those for dad, afterall he’s “King”…at least on his day!